BYU chemistry professor Ryan Kelly hopes to simplify cancer diagnoses. Photo by Jaren Wilkey. With biopsies and spinal taps, diagnosing and monitoring cancer can be intrusive and exhausting for patients, but research from BYU chemistry professor Ryan T. Kelly (BS ’01, PhD ’05) could bring an end to all of that. Instead, a simple blood sample from a patient could reveal a variety of cancers and result in tailored therapies. In the research, published in the top-ranked journal Analytical Chemistry, Kelly and his collaborators at Pacific Northwest National Laboratory and Oregon Health and Science University isolated circulating tumor cells (CTCs) from blood to determine what proteins were present. Their technique uses a new technology, called nanoPOTS, to capture more protein information from a single cell than ever before. “It used to be that the only thing you could do with CTCs was count them, which would usually correlate with cancer,” says Kelly. However, CTCs are extremely rare, and researchers traditionally required a sample of thousands or millions of cells to determine their protein makeup. The ability to glean so much information from one or a few cells is a huge stride for biomedical research and should ultimately lead to improved treatments. For example, when doctors know the makeup of tumors, including what proteins are present and at what levels, they can create better therapies for patients. 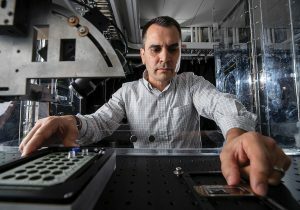 A BYU professor can detect cancer with a thumbnail-sized piece of plastic. Alum Craig Meyers stumbled upon a virus that can kill any form of cancer. Will it work in people?